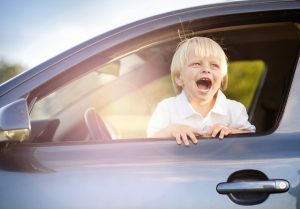 The Allstate Blog Team shared that if you are wondering how to keep your car cool during summer, there are plenty of simple things you can do. From maximizing your air conditioning to taking advantage of a shady spot when parking, the following tips can help you maintain a cooler vehicle on those hot and humid summer days. Cars can trap heat, causing the temperature inside them to quickly rise, says the National Weather Service. According to one test, a parked car’s temperature rose from 80 degrees to more than 94 degrees in about two minutes and reached 123 degrees within an hour. A car can reach up to 200 degrees inside, according to Consumer Reports. Sun shades: Sun shades help block the direct rays coming into your vehicle, says Consumer Reports. This keeps the temperature slightly lower, which can help your car cool down more quickly once the vehicle is started. Tinted windows: A more expensive, yet constant way to block the sun, says Cars.com, is with window tinting. But before you take your car in to have the windows darkened, make sure you know your state’s laws, as some have restrictions on how much or which windows you can tint. Covered parking: If you don’t have tinted windows or a sunshade, a helpful alternative may simply be parking in the shade. Consumer Reports suggests looking for a shady spot or parking your car so the sun is hitting the rear window instead of the windshield. This may help keep the steering wheel and front seats slightly cooler. Cracked windows: Because windows hold in warm air, leaving them open slightly while parked will create slight airflow. If your vehicle has a sunroof, Cars.com says you can also crack that or use the vent feature if it’s not raining. For both windows and sunroofs, only leave them open slightly (less than an inch) to help minimize the possibility of theft.